Premium upright stapler is a fusion of high performance, durability and professional style. Iconic design allows it to stand up or lie flat, making it ideal of expansive executive desktops or tight cube environments. High-quality die-cast construction means it will easily and consistently staple up to 20 sheets. The curved ergonomic shape and soft rubber comfort grip make this stapler superior handheld use. Antimicrobial Executive Stand-Up Stapler holds a full-strip of staples and uses standard staples. Convenient window alerts you when you need to reload the stapler. Dimensions (H x W x D): 7" x 8" x 1"
Seldom jams, easy to staple, easy to re-load... works perfectly for my dainty little hands. 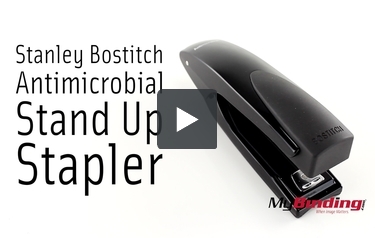 Transcript: This is the Stanley Bostitch Antimicrobial Stand Up Stapler! If you want to make an impression through your stapler, then this is it! The design and feel of this stapler is one of the best I’ve ever experienced. But in functionality, it’s just a normal paper stapler. Pull the top up to insert your standard 1/4” staples and close it up. Now you can effectively staple up to 20 pages, and it’s easy grip lets you do it off the table, too. It has germ inhibiting materials, oh and it stands vertically as well. This is the Stanley Bostitch Antimicrobial Stand Up Stapler! If you’re just stapling paper, and want a stapler that looks good doing it, this one’s for you!